Particle separation in cyclones can vary considerably depending on such factors as feed head, mud weight, percent solids, and properties of the liquid phase of the mud. Generally speaking, increasing any of these factors will shift the cut point curve to the right, increasing the size of solids actually separated by the cyclone. By itself, the cut point does not determine a cyclone's overall efficiency because it ignores the liquid loss rate. 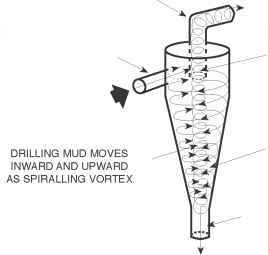 The amount of fluid in the cone underflow is important; if the solids are too dry, they can cause "roping" or "dry-plugging" of the underflow. In contrast, a cyclone operating with a spray discharge (see Figure 3-23) gives solids a free path to exit. A cone operating in spray discharge will remove a significantly greater amount of solids than a cone in "rope" discharge. What is the cut point of the hydrocyclone?